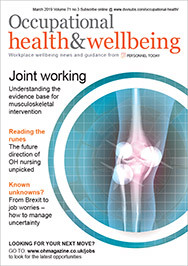 NHS occupational health practitioners do not adequately understand the health needs of older workers, with the result that OH support for this increasingly important section of the workforce is both patchy and inconsistent. Research by OH nurse practitioner Helen Arnold has painted a grim picture of a lack of awareness of the needs of older workers, a lack of training and literature and even confusion about the definition of what is an older worker. As a result, the study has called for the creation of a national policy on OH provision for older workers as well as a national audit across the NHS of the provision of OH to older workers. The study surveyed all 160 acute NHS Trusts within England, with a 60% response rate. Just a fifth of OH advisers said they had received specific training in relation to the OH needs of the older workers. There was a widespread lack of awareness of the literature and evidence surrounding the needs of older workers, although the research did concede this could in part be because of a lack of consistent guidelines from the departments of health or work and pensions and the Health and Safety Executive. Fewer than a tenth of those polled correctly classified an older worker as one aged 50 or above, with one in three suggesting such workers were aged 65 or over. While the World Health Organisation recommended that all workers over the age of 45 should be offered annual health assessment, more than 60% of the OH advisers failed to offer this or included such assessments within their OH provision for older workers. All NHS trusts and OH departments needed to ensure they had a comprehensive policy in place, developed in line with The Management of Health and Safety at Work Regulations 1999, which promoted the health of older workers, the study recommended. It also called for an overhaul of education and training around the health needs older workers and a review of the literature available.